So what is driving this global coding movement? According to a 2016 index report from the California Association for Healthcare Quality, administrative costs make up about 15 percent of all healthcare expenditures -- well over $300 billion annually. That is significant when one recognizes that the cost of care is squeezing the bottom line of practices of all sizes – health systems to hospital facilities to single doctor clinics. Coding is one of those administrative costs. There has been a growing momentum in the healthcare industry about reigning in costs to ensure profitability, which has included offshoring part or all of a provider’s coding operations. Understandably not all coding and hence not all coding companies are the same. Just as coder quality varies from coder to coder, coding quality can vary even with coders used in the same city, state, country or vendor. When you begin working with a vendor to outsource some or all of your coding, you need to set standards. The standards should mirror the standards you have for your own coders. Because they are in fact your coders. The vendor is an extension of your coding operations. Broadly speaking, these standards often include a 95 percent coding accuracy with a 24 to 48 hour turnaround. Recruitment: Do the coders, who are working for you, have the necessary nationally-recognized AHIMA or AAPC certification and not a home-grown certification or no certification at all? It is imperative that companies demonstrate that they are doing the necessary certification checks, background checks, and other verifications regardless of coder locale. Training: How are coders trained? The training rigors for coder employees need to ensure that coders are not only up to date on the quarterly to annual code changes, but also are cognizant of the coding advisories published throughout the year. With the advent of technology and online learning platforms, coders can be trained well regardless of locale to provide consistent training throughout an organization. Quality Assurance: How often are coders measured? How detailed are the measures? What training do you have in place to get coders up to and maintaining your desired coding accuracy level? What are your audit standards? Coders need to be held to the same standard, full stop. Whether it be productivity standards, coder quality level, or turnaround time, the properly coded chart can be done anywhere, anytime. It is about setting and maintaining those standards consistently. 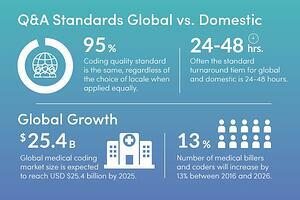 The Global Medical Coding Market Analysis & Trends 2017-2027 report, available through Research and Markets, found global coding is poised for strong growth throughout the next decade. It has been echoed by other studies showing that the global medical coding market size is expected to reach USD $25.4 billion by 2025 registering a 10% compound annual growth rate (CAGR) during the forecast period. It isn’t the matter of if, but rather when. When you are evaluating outsourcing coding in part or whole, you need to remember it isn’t a binary decision. There are companies with only domestic capabilities. There are companies with only offshore capabilities. Hence, the question is oftentimes not which one to choose, but rather how to get the best of both worlds. Often the best choice is one that offers both with the same coding standards throughout. Accurate coding that can be turned around quicker can mean faster reimbursements. The use of both offshore and domestic coding can avail yourself to coders working in a near 24 hours a day cycle, as you can have coders in more time zones and geography working for you. The result is revenue being received quicker with a more immediate impact to the bottom line. Coding needs are on the rise. The Bureau of Labor Statistics (BLS) projects that the number of positions in the field of medical records and health information technicians — which includes medical billers and coders — will increase 13% between 2016 and 2026. There is similar growth being seen offshore. How is that possible? Because the industry as a whole is growing with more patients and more visits. To maximize the value of coding, you need quality coding. Thorough quality assurance feedback throughout the audit process helps ensure all coders – domestic and offshore -- are working to the standards you want and need. The process that is the same and universally applied can provide synergies impacting and improving your coding operations and thus positively affecting your revenue cycle.